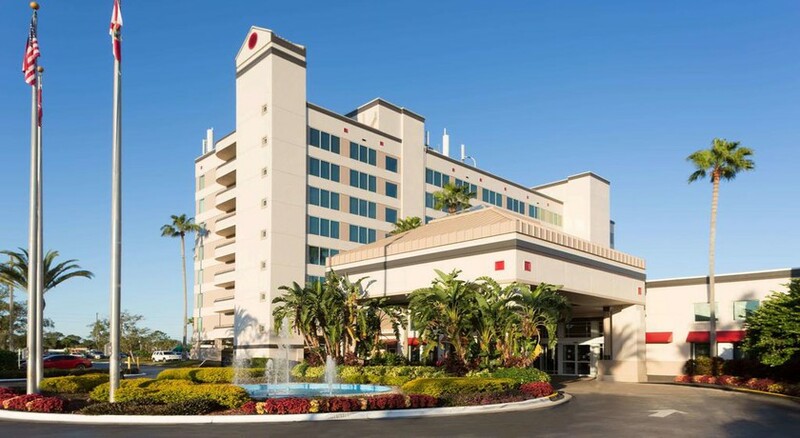 Located in Kissimmee with a free shuttle to the main theme parks in Orlando, the Ramada Gateway Hotel provides modern accommodation with a range of on-site amenities to make your stay as comfortable as possible. With a fitness centre, arcade room, sports bar and grill, there are plenty of opportunities to relax after a long day exploring Orlando and everything it has to offer. 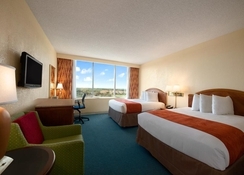 The rooms at the Ramada Gateway Hotel can sleep between 2 and 4 people and this is a family friendly property that also provides close access to all the major theme parks, Orlando International Airport, Florida Mall as well as numerous golf courses in the surrounding area. 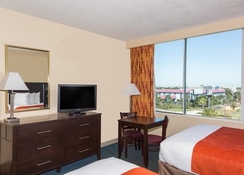 The Ramada Gateway Hotel is close by to the major attractions in Orlando and with a free scheduled shuttle service to the main theme parks you don’t need to worry about transportation. Disney’s Hollywood Studios (2.5 miles), Walt Disney World (5.9 miles), SeaWorld (9.3 miles) and the Florida Mall (16 miles). Golfers can also play on a range of courses in the vicinity of the hotel which includes Mystic Dunes Golf Course which is only 1.5 miles away from the property. 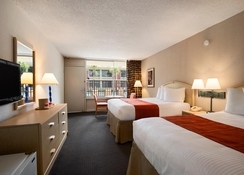 There are 353 standard rooms available at the Ramada Gateway Hotel as well as 147 Deluxe Tower rooms. 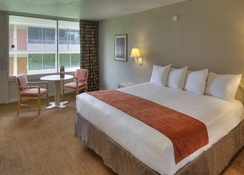 Overall there are 6 different room types including Standard Rooms, Standard Queen Rooms with 2 large double beds, Deluxe Queen Rooms, Queen Rooms with disability access, Deluxe King Room and the Deluxe King Suite which also features a sofa bed. 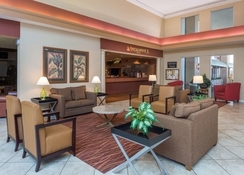 All rooms at the Ramada Gateway Hotel come with a fridge, tea and coffee facilities as well as cable TV and WiFi is free at the property too. There are 3 dining and drink options at the Ramada Gateway Hotel which means you certainly won’t go hungry during your stay. Andy’s Pizza and Deli serves pizzas, snacks, homemade sandwiches, salads and soups between 7am and 11pm, the Smokehouse Grill is open for breakfast (7am – 11am) and dinner (5.30pm and 10pm) and offers steaks, ribs and other meals while Mulligans is a sports bar with a range of alcoholic and non-alcoholic drinks, cocktails and is open from 5pm to 11pm daily. 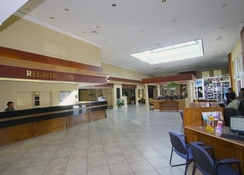 The Ramada Gateway Hotel has lots on-site to keep you occupied including a basketball court, billiards tables, arcade room and table tennis facilities. There is also a fitness centre and mini golf while the hotel itself is within reach of the main theme parks where a free shuttle service is available for guests. The Mall at Mellenia, Disney Springs and Lake Buena Vista Factory Stores are all easily accessible and provide excellent shopping opportunities. Had a fab holiday .Rooms are basic but everything you need as we only used it for sleeping in ,as we were our most of day .Staff very helpful ,pools were also good only us in on occasions we visited .